This is India's first indigenously designed and developed long-range cruise missile. The missile was developed by Aeronautical Development Establishment (ADE) a lab under Defence Research and Development Organisation (DRDO). New Delhi: Indian defence forces have one more reason to cheer as Defence Research and Development Organisation (DRDO) on Monday successfully test fired its indigenously developed long strike range sub-sonic cruise missile, Nirbhay off the coast of Odisha on Monday. This was the sixth test of the nuclear-capable cruise missile which in past has tested some failure. This test is significant as it comes at a time when tension between India and Pakistan is at its peak, the Defence Research and Development Organisation (DRDO) has been carrying out back-to-back successful tests of indigenous weaponry. DRDO has carried out a total of fives tests of their homegrown modern weapon system post-Pulwama attack. This is India's first indigenously designed and developed long-range cruise missile. The missile was developed by Aeronautical Development Establishment (ADE) a lab under Defence Research and Development Organisation (DRDO). 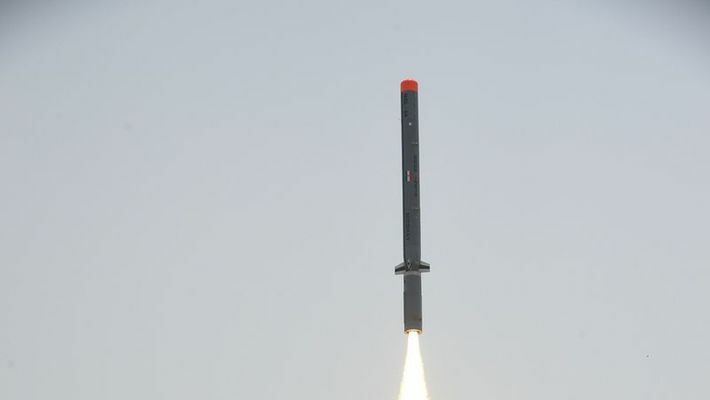 The surface version of Nirbhay missile was the first test fired for the first time on 12 March 2013 from the Integrated Test Range at Chandipur in Balasore district of Odisha. The Nirbhay is a subsonic long-range land attack cruise missile that can be armed with a 300-kilogram warhead. The nuclear-capable, solid fuel, the missile is capable of reaching speeds of 0.6-0.7 Mach and can strike land targets at a distance of up to 1,000 kilometers. The 6 m long Nirbhay has a diameter of 0.52 m and is fitted with two tapering-chord fold-out (backwards) wings with a span of 2.7 m. The one-tonne missile is brought up to the takeover speed of its turbofan engine by a jettisonable solid propellant booster. This is the sixth test of the Nirbhay, which is a subsonic cruise missile, distinct from the supersonic Brahmos. The Nirbhay was first tested in 2013. The Nirbhay missile had a problematic development, with some of the early tests experiencing failure. The last successful test launch of the missile had taken place in November 2017. An earlier test launch in December 2016 had ended in failure as the missile had to be destroyed in mid-air after it deviated from its course. Two other test launches had also ended in failure, with only one other flight trial in 2014 a success. DRDO engineers had attributed the failure to problems with the flight control software and navigation system of the missile, as well as hardware design flaws. All those issues had since been resolved. According to the Defence Research and Development Organisation (DRDO), the Nirbhay cruise missile uses a turbofan engine and uses inertial navigation and GPS guidance to reach its target. The Nirbhay has a range of around 1,000km. The Nirbhay is similar in concept to the US Navy's Tomahawk cruise missile. The Nirbhay can navigate to its target by flying past preset 'waypoints' on its route, often flying at very low levels. Cruise missiles like the Nirbhay are considered more versatile than the Brahmos as the former can be re-targeted more effectively in flight and can “loiter” in flight, scouting for targets. Subsonic cruise missiles are also lighter and smaller in dimension, allowing for deployment via submarine-torpedo tubes. According to sources once the technology behind the missile is certified, there is a proposal to develop an air-launched variant of the Nirbhay within two to three years.